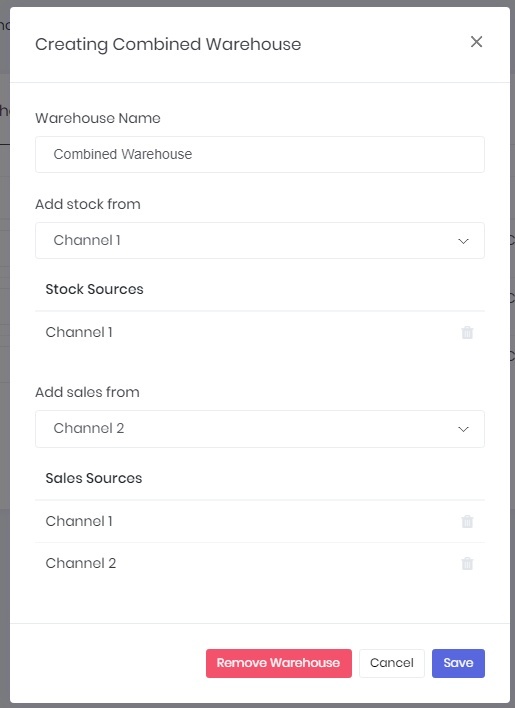 In order to set up a second warehouse, you will need to connect a more than one channel to your Inventory Planner Account. For separate warehouses with separate replenishment needs, you do not need any further configuration. 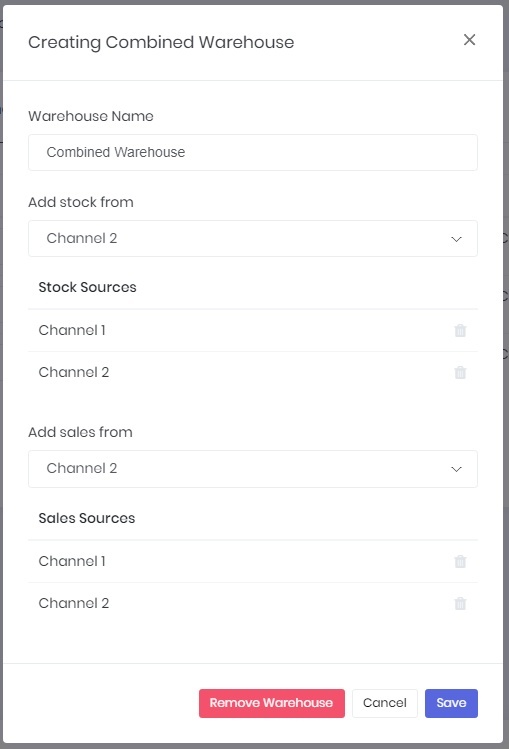 When you have two sales channels but use the same warehouse (for example, online and retail store sales), you will create a combined warehouse using sales information for both to build a joint forecast, but you will use only stock from one channel. Using stock from both sales channel when there is one warehouse will double-count inventory in stock. First, click 'Create Combined Warehouse'. Then fill out the combined warehouse name. Add stock from one sales channel and Add sales from both channels that will fulfill from that warehouse. Save then review the Combined Warehouse to ensure you have stock from one sales channel and sales from two sales channels. For more details on how to handle replenishment for your combined warehouse, read our article on setting up lead times and transferring inventory between warehouses. When you want one replenishment order for two sales channels in two warehouses, you will set up a combined warehouse incorporating sales and stock from both sales channels. This may be the case if you are ordering from an oversees supplier and will have the shipment delivered to one warehouse and part of the shipment transferred to a second warehouse domestically. Then name your combined warehouse. Add stock from both sales channels and Add sales from both sales channels. Save your new combined warehouse and check to see that you are pulling stock and sales information from both sales channels.